We all are very much familiar with YouTube for watching funny videos, comedy shows, thriller videos, learning videos or much more. But, nowadays YouTube is a great tool for marketers for promoting services and generating some quality traffic for the websites. According to the Hubspot report, YouTube has more than 1 billion active users. This video platform is so big, it can be accessed in 76 different languages, reached about 95% of the world’s population. After the Google search engine, YouTube is the second largest search engine. It can improve your brand presence in no time. – According to the global reach, YouTube has more than 1 billion active users. – Almost everyday users watch hundreds of millions of hours on YouTube and generate billions of views. In the age of Social Media, every online and offline organization’s owner promotes his/her services globally in terms of video. That’s why it’s the right time to learn the strategies and techniques of YouTube marketing. As discussed above, approx 300 hours of video uploaded to YouTube every minute of every day. So, the question is: How can you guys boost up your videos on Youtube? There are two methods for promoting the video. If you want to promote your videos organically on Youtube, you must know about a few tricks about Search Engine Optimization. By the help of good SEO technique, you can easily boost up your videos on YouTube. 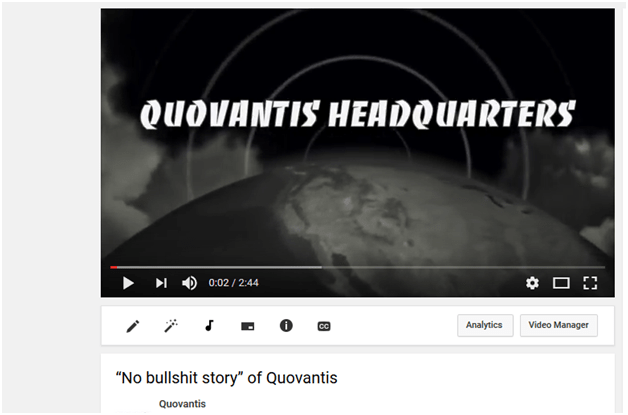 Like web promotion SEO, the YouTube SEO starts with searchable keywords research. 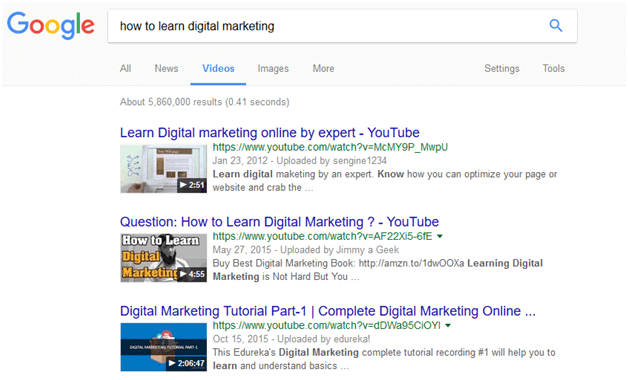 As you can see on the image above image, I was searching “how to learn digital marketing” (this is my searchable keywords). Lots of videos are showing on search engine result page. But, I have picked up these three just for reference. Look at it with your deep eye. These guys have used the keyword “Learn Digital Marketing” in the title as well as in description. So, this is your first lesson always use your primary keyword in ‘Title’ as well as the in ‘Description’. As we know that the competition on video marketing is very high, the users have the option to close the video and start another video. So, it’s a must that you (always) upload an awesome video for healthy user engagement. Most of the B2B and B2C organizations hire a professional videographer for the day and pay them for generating high-quality video which is attractive and eye catching. Video editing is expensive. The expense depends on video length, quality, graphics, and frames. At the time of video uploading, you must remember one important thing- your video must be optimized according to search engine rules. Oh!!!!!! Yes. Search Engine Optimization rules. The rule is very simple or very complex. It depends on you, how you can implement these rules while uploading the video on YouTube channel. Video Title: – Remember always one thing: the title is very important for web page optimization as well as video optimization. The ideal web page title length is 50-60 characters. The ideal title length of video should be at least 5-words long. You must put your keyword in this 5-words long title without keyword-stuffing. So, In short for better understanding you should always use your main keyword in the video title without keyword stuffing. Video Description: – Description is very important for web page optimization as well as video optimization. The ideal web page description length is 150-160 character. The ideal video description length is approximately 980 words or 4850 characters including spaces. If you are familiar with social media marketing, you know that description is very important. Because Google or YouTube determine your video through your content. Some guidelines which can help you to write a meaningful description for your video. For improving the CTR (Click Through Rate) put your Blog and Website link at the top of the video. Use your main searchable keyword between 25-30 words. Always write more than 250+ words in the video description. .Use your keyword at least 2-3 times. These small guideline helps you to boost up your video on Google and YouTube without being spammy. Don’t work like a spammer… Always choose a unique method. Tags: – Tags aren’t very important… but, yes they can help. After lots of research and reading lots of blogs, I analyzed that the best time to post on YouTube depends on your targeted audience and country. For example, all the B2B organizations want that lots of users view their video and subscribe to their channel. So, I am sharing some most popular time with you when B2B organizations get more high engagement. On Saturday and Sunday (Weekend), a post-time between 9 a.m. and 11 a.m. is optimal. As per the research, Monday to Wednesday from 2 pm to 4 pm is an ideal time, Thursday to Friday between 12 pm to 3 pm is most suitable time and on weekends between 9 am to 11 am is the best time. All the time are EST zone. As we all know that YouTube is the second popular search engine, as per the research approx 72% of B2B marketers use YouTube to host their video content. For B2B organizations YouTube marketing help to increase their brand awareness by uploading awesome videos. Uploading the video content is a great way to advertise your products and provide other businesses with more in-depth and comprehensive information regarding their features and uses. Most of the B2B organizations explore their brand, services, and product through YouTube marketing. In this Digital Age, there is a huge competition between B2B organizations. So, building a high Brand Recognition is really important. Can you believe Intel, Cisco, and Oracle all these B2B companies do video marketing for their unique brand and image on a daily basis?